Body language is a big part of your feminine image. In fact, it counts for over 50% of the impression you make on people. Is your body language telling the world that you’re a fabulous female? In not, it can be fixed! Curves are a classic feminine feature. Beyond a bubbly booty and ample bosom, you can use your posture to enhance the curves of your body. Create an S-curve by putting your weight on one leg and pushing your hip out. Contrast this to a more masculine posture where the weight is evenly distributed between both legs. This creates a more square and angular silhouette. DO keep your weight on one side of your body instead of centered. DON’T exaggerate this posture. It should look natural. DO work the s-curve when you’re seated by crossing your legs or sitting with your weight on one hip. A wide, open body position is considered a “power pose.” That’s why you often see men spread their legs and lean forward at the shoulders. They’re essentially puffing themselves up to look larger than they are. On the other hand, a more closed position will make you look more feminine and elegant. It also makes you appear physically smaller. DON’T slouch in an attempt to appear shorter or smaller. DO stand and sit with lifted posture. Think “tall” instead of “wide” with your body posture. Gestures are an important part of body language. Women tend to be more expressive with their gestures than men. 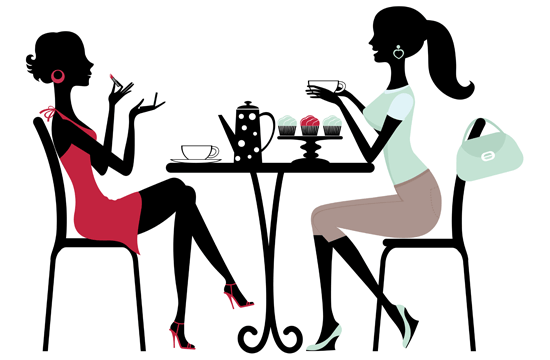 Next time you’re out, notice the way women use their hands and bodies to express ideas when they talk. DON’T make jerky or clumsy movements. Keep your elbows tucked in and don’t move too quickly. Practice making slow, smooth movements in front of a mirror. DON’T overdo your gestures. Observe women to get an idea of the correct balance. DON’T fidget. Avoid nervous movements like twirling your hair, shaking your leg, or tapping your fingers. The expressions you make say as much as the words that come out of your mouth. If you’re feeling nervous, it’s easy for this to be reflected on your face. On the other hand, a pleasant facial expression puts people at ease and helps you get the respect and acceptance you deserve. DO put on a pleasant face. Keep the corners of your mouth turned up slightly. This also serves as a natural facelift! Eye contact is a major way to gauge a person’s personality. People who don’t make eye contact appear insecure or as if they’re hiding something. People who look you in the eye appear confident and sincere. DON’T avoid people’s eyes. Be proud of who are you are and look people in the eye. Body language is a fascinating topic and these dos and don’ts are only the tip of the iceberg. Let’s continue the conversation below! What other subtle body language differences have you noticed between men and women? Do you have any other tips to pass along? P.S. 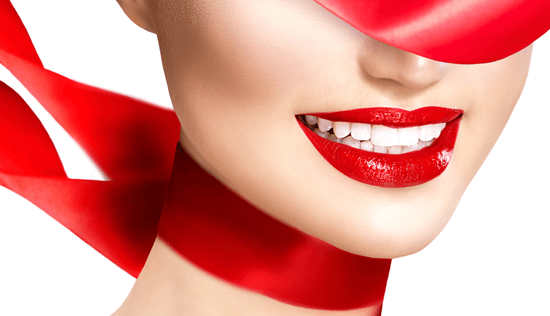 Want to learn more about how to to master your feminine presentation? 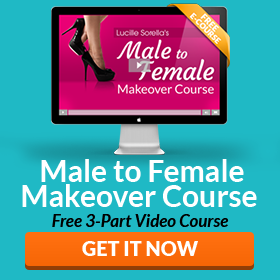 Sign up for my free 3-part Male to Female Makeover Course here! 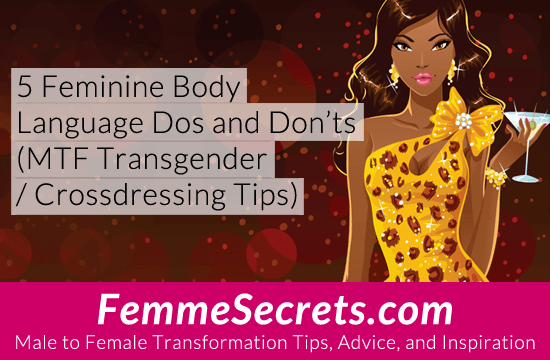 Even having been post-op and retired for many years, I still have to revisit all these tips often.Ultimately, they renew your spirit, give a boost to your self-image and remind you of how special it is to be a woman. It’s very easy to identify a male in drag, if he fails to sit properly, walk in a feminine manner, or gesture with his hands in an expressive way. All that you say here, is very true; and needs to be practiced until it’s perfect, if a crossdresser, a transgender M to F, or a Transexual who wants to be seen as a female intends to blend in, instead of standing out, and being “made.” Thank you for helping the less well informed. Since now that I’m retired, I try to blend in as any other woman I see. I’m living now 24/7 as a female. I try to adhere to all the suggestions that were made here. Especially eye contact and smiles when talking to men! So much fun. Here I am today at the mall again (my favorite place) trying on some dresses.